White Strains are famous for extreme resin content, outlandish power & strong medicinal effects. To be completely honest, these beauties only look white. If you could scrape off the thick coating of THC crystals, you'd find lush green underneath - but who in their right mind would want to do that? Buy Your White Strains from Gorilla Seeds - We Have 'em All! A Toxic Beauty with 1100 gr Yields! Blue Venom seamlessly combines White Widow’s dense, rocky buds with Blueberry’s incredible flavour, for an easy, fail-proof feminized seed that’s done in 55 days! Crystal Coated, Mould Resistant, 8% CBD! Seedsman's CBD Sweet N Sour Widow delivers up to 400 gr/m2 of airy, crystal-coated buds that can tolerate extreme humidity & dampness. Two icons came together to create G13 Labs Hypnotic. This weed seed's a super performer in any environment & with any technique. True Medical Power - 20% THC! Rhino Ryder Auto is a near-narcotic creeper with 20% THC that is physically relaxing & mentally calming for the ultimate MMJ. Tastes Like Cinnamon & Pears - Delicious! Incredible Indoor Strain - Easy, Fast, Fruitful! White Critical joins together 2 of the most beloved strains ever for an indoor powerhouse that makes raw newbs look like seasoned pros with tons of serious dank! The World's Most Popular Seed! White Widow is, hands down, the most popular & highest selling cannabis seed of all time! The finishes are fast, the yields are massive & the resin content is legendary. If you don’t like power and/or speed, go smoke a dandelion or something. AK 48 responds to AK popularity by being faster and better. Nirvana Seeds AK 48 is beloved for one simple reason: the buzz is awesome. Her Indica/Sativa genetics give a balanced effect perfect for almost anything; she makes you feel great and not as lazy as normal. Get'cha some! This Great White Shark hybrid delivers intense medicinal power & crazy-thick resin in practically no time. She's astounding! Genuine White Genetics, 10 Week Finish! Thanks to Dutch Passion's ingenuity, you can now get all that legendary White Widow frost & strong, balanced high in just 10 weeks from seed. Yields are big, too! Black Widow is a dark-green showpiece with an abundance of powdery white resin & fresh, minty flavours & plenty of power at a full 19% THC. No, but The Gorilla can. He can see you purchasing several of these beauties because you’re a smart customer. Blue Mystic has a delightful azure color in addition to her Northern Lights-like properties when kept indoors as recommended by Nirvana Seeds. With a reasonable odour compared to other strains, she won’t blow up the entire house. Positronics hit the nail right on the head with Blue Rhino Seeds. These blue-hued masterpieces will soothe what ails you or allow you to simply chill for the evening. Awesome! What’s the best way to celebrate any day you bother to get out of bed? Get some Blue Widow and get the blues! The Gorilla always has the blues, and cherishes that sweet bubble gum flavour above all others. He claims it makes his breath fresh too, but that’s debatable. Buy yours today - the price is always right! Got What It Takes To Swim with Bullshark? Jump right in - the water is fine! Bullshark's got a strong bite, but she'll leave you intact - just really, really stoned. Smooth, fat & unforgettable, this feminized seed is a killer! 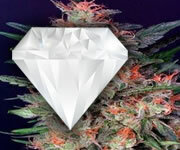 Chrystal is an award-winning feminized seed that took first place at the Dutch Highlife Cup in 2002. A White Widow x Northern Lights cross, Nirvana Seeds Chrystal is an über-sticky strain that exudes a kerosene-like aroma that tempts, teases & always pleases! White Always Equals Maximum Power! Unlike many other parts of life, there's nothing plain, boring or generic about Gorilla Seeds' extensive line of White Strains. This little corner of our online shop includes our most highly sought-after cannabis seeds including several genuine High Times Cup Winners. You will not be disappointed! Widows, Rhinos, Sharks, Russians & More! While White Widow is the most famous member of the White Family, there are literally hundreds of hybrids that claim to be authentic White Strains, and The Gorilla has gathered the absolute best high-THC cannabis seeds from this category to make your shopping experience simple & easy. Our favourite? It has to be Serious Seeds' White Russian. Nothing tops these babies when it comes to frost, and the THC is staggering at a full 22%. You can pick these little powerhouses up right here at Gorilla Seeds in either regular or feminized form! The Gorilla has priced all our White Strains extremely low to grab your full attention (as if all that goo wasn't enough) Don't miss out - order today! Don't Wait - Order Your Favourite White Strains Today!